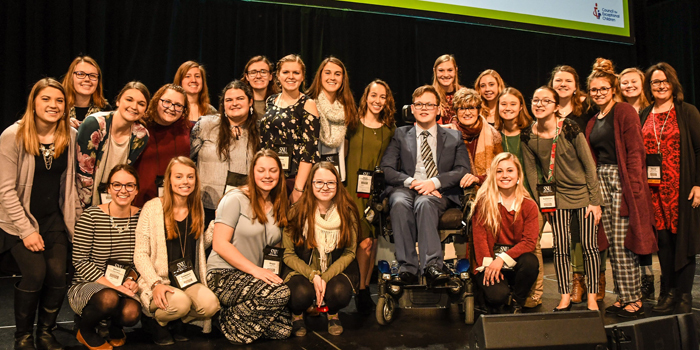 WINONA LAKE — Twenty-two students from the Grace College School of Education attended and helped to host the Council for Exceptional Children national convention in Indianapolis Jan. 29 to Feb. 2. The CEC is a professional association of educators that serve students with exceptionalities through advocacy, professional development and training for its members. This year’s convention and expo featured more than 400 sessions, workshops and learning labs from educators and experts in the field. The Grace CEC Chapter accompanied Mason Metzger, a 2017 Warsaw Community High School graduate, to the Yes I Can Awards at the convention. The awards recognize achievements of students with exceptionalities in six categories: academics, arts, school and community activities, self-advocacy, technology and transition. Metzger, who has spastic cerebral palsy and is well-known for inspirational speaking, was nominated for and won the 2019 Yes I Can Award for self-advocacy. Karyssa Davis, vice-president of the Grace College CEC Chapter, said the Yes I Can Award ceremony was the most memorable part of the conference. Barge was particularly impacted by a workshop and screening by filmmaker Dan Habib, who spoke about the work that went into his documentary “Intelligent Lives.” The film shows how much people with intellectual disabilities can accomplish.